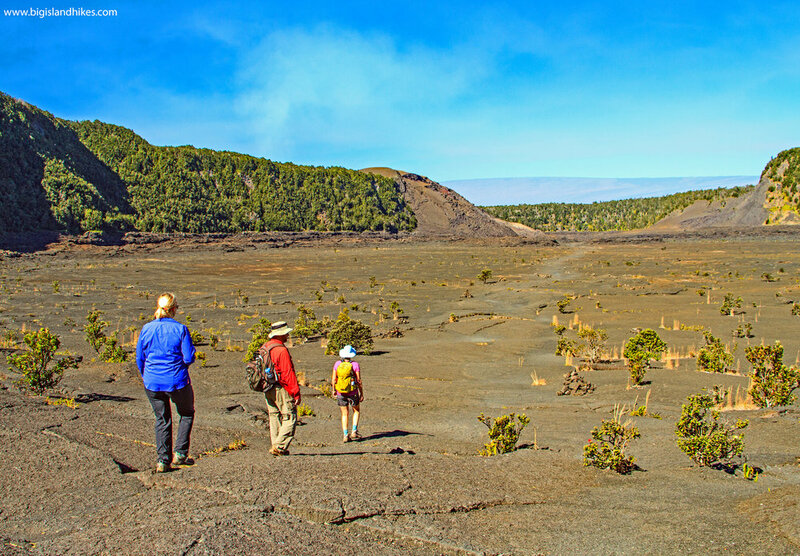 This popular trail traces the northern rim of the Kīlauea Iki (literally little Kīlauea) Crater and then returns to the trailhead across the center of the crater itself. It’s an exciting and easy hike that crosses warm fifty year old lava with steam issuing from cracks in the earth caused by rainwater that has percolated and boiled. Some of the rocks on the crater floor can be too hot to touch! Kīlauea Iki is a pit crater that is created by the ground above a void below the earth’s surface giving way and sinking together, usually leaving nearly vertical walls. In 1959, lava shot some 1900 feet into the air from Pu’u Pua’i (literally gushing hill) and began filling Kīlauea Iki until it started to drain into the main Kīlauea Caldera. There is still a slightly visible “bathtub ring” at the high point of the lava in the crater. It is also possible to visit Nāhuku, the Thurston Lava Tube, from this trailhead. Trailhead: Find the entrance to Hawai'i Volcanoes National Park a few miles to the west of the town of Volcano Village. Pass through the entrance and drive straight ahead for less than 100 feet and turn left onto Crater Rim Drive. Follow Crater Rim drive for a few miles until you reach the large parking area for Kīlauea Iki and Nāhuku (Thurston Lava Tube). This is a popular area and sometimes fills up quickly. If parking is full, turn around and drive 1/4 mile back toward the Visitor Center and find another overflow parking lot. Hike: Begin at the parking lot and hike on the Crater Rim Trail that leaves from the northern end of the lot. This trail takes you along the northern rim of the crater in dense rainforest. From time to time there are clearings with nice views onto the crater floor. Note the faint line that crosses the crater – that’s the trail created by many feet that you’ll be on soon. After 1 mile, you reach an intersection with another trail that would take you to the Visitor Center. Stay on the Kīlauea Iki Crater trail. After 1/4 mile, you reach another intersection with a trail that takes you along Byron Ledge. Again, stay on the Kīlauea Iki trail. You’re now heading south and after 0.25 mile, you turn east and begin to descend about 150’ down onto the crater floor. Hike straight across the crater on lava from 1959, following large ahu (cairns). Be sure to spend your time exploring along the trail, looking into cracks and steam vents. Be sure to spot the beautiful red flowers on the craggy trees – these are called ōhi’a lehua trees and they are the first life to begin to grow on lava flows. Related to a distant cousin in New Zealand, these beautiful trees evolved on the Big Island of Hawai’i to close their stomata to block out sulfur dioxide gases during volcanic eruptions. Local legend has it that picking the lehua blossom will make it rain. When you reach the other side of the crater, climb almost 500’ to the parking area. It is possible to do this loop hike in the opposite direction.